For any fish hobbyist it is crucial to check the water parameters of an aquarium to ensure pristine water quality and the overall well-being of a fish. This often leads to two often asked questions: how do you check the water parameters and what should you be checking for? From ammonia test kits to pH readers the various brands and testing methods might be overwhelming. The two most common ways to check water levels are five in one test strips and a master test kit. Beginner fish hobbyists often buy test strips because of how easy they are to use as they simply require a dip in the fish tank for a couple of seconds. While useful for roughly checking water parameters it's somewhat difficult to tell exactly what the levels are and accuracy can fluctuate. Once a test strip container is opened moisture from the surrounding area will begin to alter the results, making them inaccurate. 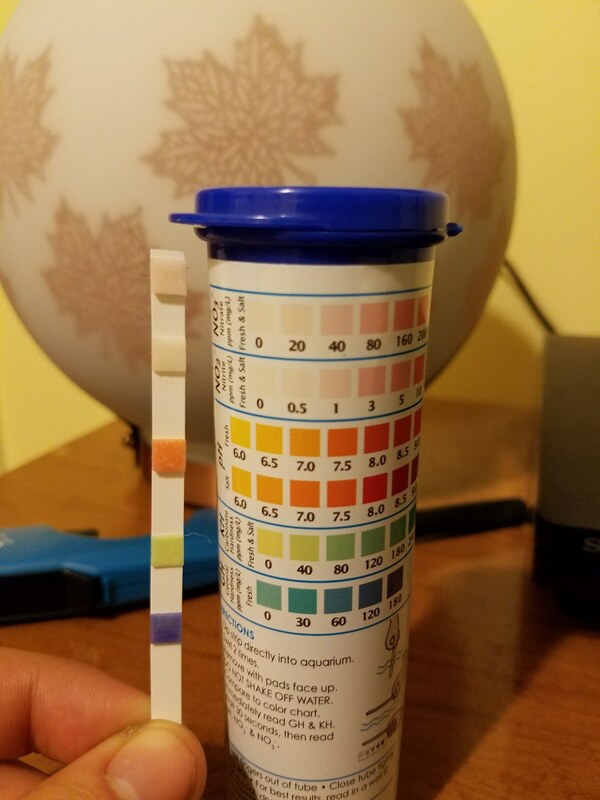 Test strips are initially cheaper than a master kit, but while they check for nitrites, nitrates, the pH level of the water, carbonate and the general hardness of the water it's missing an essential component: ammonia readings. For the 5 in 1 test strips a 25 count container costs around $9. To buy a container of 25 ammonia test strips costs around $12. The cost is about 80 cents per strip, making it more expensive over time compared to buying a master test kit. Master Test Kits come in containers that look like the beginning to a basic chemistry lab, but they are quite easy to use after a few tests. 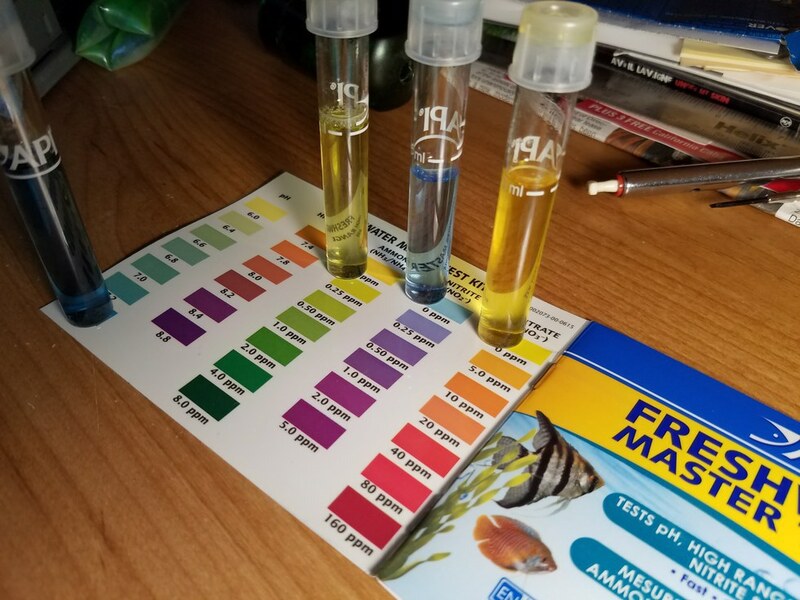 The API Freshwater Master Test Kit comes with four vials that hold around 10ml of water and an assortment of solutions that test for pH, high range of pH, ammonia, nitrite and nitrate levels. Master Test Kits are much more accurate than their test strip counterparts and cost a lot less in the long term. 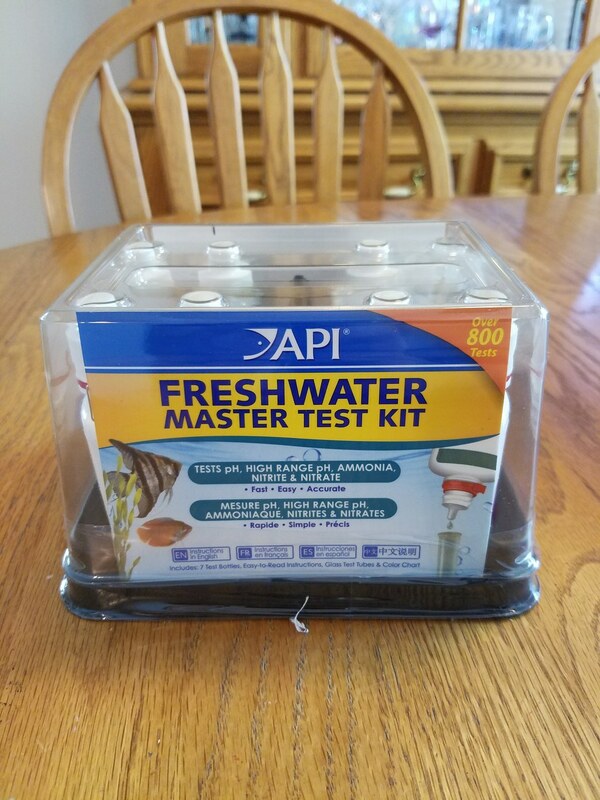 The API Freshwater Master Test Kit costs around $27 and if a conservative estimate is used when calculating the number of tests per kit the cost per use averages 30 cents. There is an expiration date of around 3-4 years on the solutions included in the test kit, although this shouldn't be a problem even if a test kit is used sparingly. An instruction booklet is included in the API Freshwater Master Test Kit and is easy to interpret. Each vial has a line that measures 5ml of water to be tested as well as solutions that measure pH, ammonia, nitrites, and nitrates. For pH add three drops from the test solution (which conveniently comes in a container with a dropper). Adding five drops in a separate vial will display the correct pH level in the tank if the pH level is higher than 7.6. 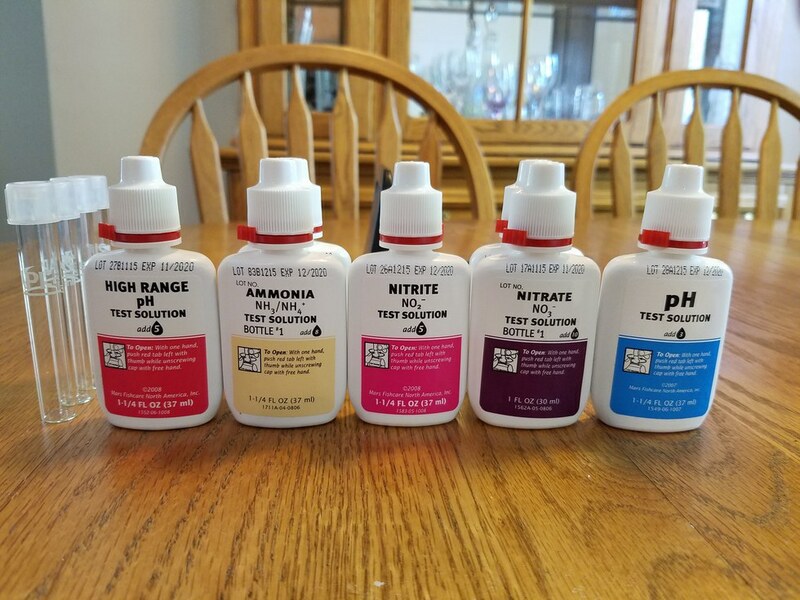 The API Freshwater Master Test Kit comes with two bottles of ammonia test solution, so adding eight drops from bottle #1 and eight drops from bottle #2 (while shaking the vial for a few seconds in between) will display the correct levels of ammonia in the tank. To test for nitrite levels adding 10 drops of solution and shaking the vial for a few seconds is all that's needed to check for nitrite in a tank. The biggest complication in the API Freshwater Master Test Kit is the nitrate test, which involves two bottles of solution. Adding 10 drops from bottle #1 is all that is needed, but it is crucial to vigorously shake bottle #2 for at least 30 seconds to ensure accuracy of the results. One of the ingredients "wants to solidify out of a liquid solution" if the test bottle sits for any period of time, giving a falsely low reading for nitrates if it isn't mixed up. Once all of the solutions have been added and the vials shaken it will take at least five minutes for the test results to show up. Each vial will show a different color for the test readings, which are then compared to a color pallet that the test kit comes with showing what each level is at. As a general rule ammonia and nitrite readings should be as close to 0 ppm as possible, while nitrates should be below 40 ppm. Five in one test strips may seem tempting, but because the results are harder to interpret the tests can be rather inaccurate and the price is generally higher. Purchasing a master test kit is worth the investment despite the initial cost. The readings are much more accurate, ensuring happy fish, a healthier fish tank and an even happier wallet. We have to stay engaged, informed and most importantly unbiased. Let me preface this by saying that I'm no one's poster child for youth political involvement. I'm a 19-year-old college student who is finally waking up to what an enormous responsibility it is to be an active participant in government. There are some who grow up discussing the significance of legislature being passed or party affiliation over dinner, and then there those -like me- who didn't realize George W and George H. W. Bush were two different people until middle school. Regardless of your prior understanding, or lack thereof, of how American government works, what's important is that you make it a point to educate yourself and do your part to shape the future you want for your country. Considering the events of the last three years in the United States, it's safe to say that strong political opinions have sparked a surge in activism. People took to the streets in protest after the results of the 2016 presidential election, there were nationwide demonstrations to push for more restriction on gun laws and the voter turnout for 2018 midterms was the highest it's been in 50 years. The level of awareness and engagement that I'm seeing in my own generation attests to a larger political awakening. With the newfound consciousness of how important our voices are in shaping the nation, I feel that one aspect that we often overlook as we come into our political identities is the danger of party polarization. Polarization is when stances and voting habits are strictly defined by the party you identify with. What I've come to understand in watching the way people react to political opinions different to theirs on the news, in media and everyday conversation is that party association is deeply in most Americans identities. Someone's stance on immigration or abortion is less about their view on that particular issue and more about the way we perceive their entire character based on that view. People look at issues through a lens affected by years of social shaping dependent upon the circumstances of their life. We have political parties to reflect the differences of opinion and channel similar ones. The trouble with party identification is that it creates an echo chamber, fooling us into thinking that our way is the right way, that everyone thinks the same way and it trains us to become biased listeners. My advice for my young political activists is to learn how to discern biases in information and be aware of party polarization. We need action based on informed decisions. To be truly informed we have to be willing to hear and understand more than one viewpoint to make a positive change that benefits the lives of even those who think differently from us.